Suzuki’s Samurai is most memorable for its charm bracelet-tiny size. Today’s Nice Price or Crack Pipe edition turns that notion on its head by being sort of a Scrambler edition. Will that, and its price, make you long for it? Yesterday’s 2003 Brabus ML58 may have once cost a pretty penny, but at present 57% of you think its current price doesn’t make a lot of cents. Perhaps it was a hint of questionable provenance, or maybe it’s just that the Sweet Home Alabama-built Benz base was never all that alluring to begin with. One truck that over the years has seemed to have grown in popularity is Suzuki’s Vern Troyer-sized Samurai. This turn of events no doubt vexes Suzuki Motor of America execs as they couldn’t seem to get U.S. buyers all that excited about their 4-wheeled offerings when new, to the point that they stopped selling them back in 2012. 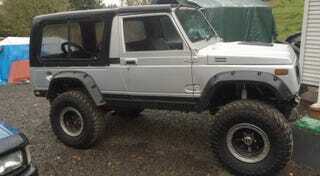 This 1985 Samurai however, is all that and a bag of chips. Well, actually it’s a bag of longer than normal wheelbase. The Samurai you all know - and, according to Consumer Retorts, have at one time or another possibly flipped - came with a skateboard-like 80-inches between the wheel centers - the same as the original Jeep. This rare extended version offers a luxurious 94-inches axle to axle, and a more commodious cabin atop that. Why haven’t you seen this version before? If you’re Canadian - eh, you probably have, as that’s a place where these showed up. We never got them officially here in the States, but at this age, and with lackluster northern border security, it’s no doubt that one or more of them have made their way south. This one - in silver over need-to-adjust-the-white-balance on the camera - is likely a refugee from the land of Poutine, but today takes up residence in Oregon. The fact that this Japanese-built truck is registered there, while advertised in Orange County, California just adds to its international flavor. Another thing potentially in its favor is the engine. The Samurai original came with a squirrel on a wheel to power its 4WD. This one has been upgraded to a mill out of a later Sidekick which I guess would make it a 1.6-litre G16? That’s bolted to a manual gearbox of indeterminate cog count. At least it’s not an automatic, amiright? Along with the bigger body and bigger motor comes bigger suspension bits. The ad notes huge (or maybe they just look huge owing to the juxtaposition with the Samurai) Toyo meats, upgraded springs, long-travel shocks, and power steering also from a Sidekick. Man, you know what, there’s one sad Sidekick somewhere out there. The total amount claimed sunk into the truck is $14K. Investment, as we all know, has little relevance to a current value, but it does seems to be a required inclusion in most ads these days. All that dough has made for a pretty butch-looking Samurai, and the extended wheelbase is subtle enough to make it also double-take worthy. A clean Oregon title serves as the mike-drop, and wraps the package in a nice government-certified bow. How much for this rare little Suzuki? The seller is asking $9,500, and if you’ve seen prices on the standard edition trucks, you’ll note that they have numbers and dollar signs too. But what about the value proposition here? Is this long but seemingly not long in the tooth Samurai worth $9,500 as presented in the ad? Or, is that too hefty a sum to pay for this warrior?